What is Laser Varicose Vein Treatment? Varicose veins are a common problem that affect millions of women. The bulging blue/purple veins on the lower leg can be painful and unsightly, affecting our choice of clothing, self confidence and day to day life. Varicose veins occur when the valves in veins of the lower leg do not function properly. This causes blood to flow back down into the leg and settle in the veins, causing bulging. Some say they are caused by a variety of factors including hormones, obesity, ageing and standing or crossing legs for long periods, however this has not been proven definitively. Most varicose veins do not pose any major health problems, however, left untreated they can cause chronic venous insufficiency leading to ulceration and complications. Our simple laser treatment can successfully correct varicose veins in just a few treatments with short recovery times and minimal risk. Before your treatment we request that you come in and have a consultation with one of our surgeons to assess your suitability for the treatment and for us to fully explain the procedure. Local anaesthetic is applied then very small incisions (less than 3mm) are made in the skin around the veins. The fibre-optic laser probe is then eased into these incisions. Sections of the affected vein are heated with the laser to a high temperature causing it to shrink and then seal shut. The healthy veins around the now closed vein restore normal blood flow to the area. Treatments take between 45 and 90 minutes depending on the vein and the leg may be bandaged after the treatment for support and to reduce swelling. Following your treatment, the area may feel warm and you may notice some redness, swelling and bruising, this will all fade in the days following your treatment. Any dressings will be removed at one of your aftercare appointments. 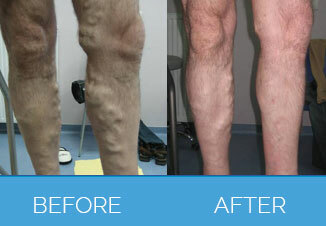 Dependent on the location and severity of the varicose veins, treatments normally takes 45-90 minutes. The results of this treatment are permanent. You can go back to normal activities the same day. Though we recommend you avoid excessive heat for about two weeks after (e.g. sunbathing, sunbeds, saunas). Your skin may be quite red for a few days after the treatment, and you will need to wear special support stockings for 7-10 days; you should consider this if you’re planning a trip or special day. Yes, there are alternative treatments for varicose vein removal, however lasers are proven to be safe, effective and affordable. There are no patient stories for Laser Varicose Vein Treatment.